If you have an old microcar or scooter you've probably run into this problem- the old tires are stuck to the rims and you can't get them off, and the nuts holding the wheels together are hopelessly fused together in a rusty embrace. Local service station tire breakers can't or won't handle 10" rims, so you're left on your own to buy a small tire remover from a place like Harbor Freight Tools, or figure out another way. Here's a way to do it that's relatively fast and easy, uses power tools, creates showers of sparks, and lets you engage in a little controlled destruction. 4. Pneumatic cutoff tool or Dremel with a cutoff wheel. 5. Safety equipment of your choosing; I use eye protection, dust mask, and gloves, but you know what works best for you when using inherently dangerous power equipment. 1. Put your wheel up on a block ( I use a plastic cat litter container) so it's easier to work on and your blade doesn't hit the pavement. 2. 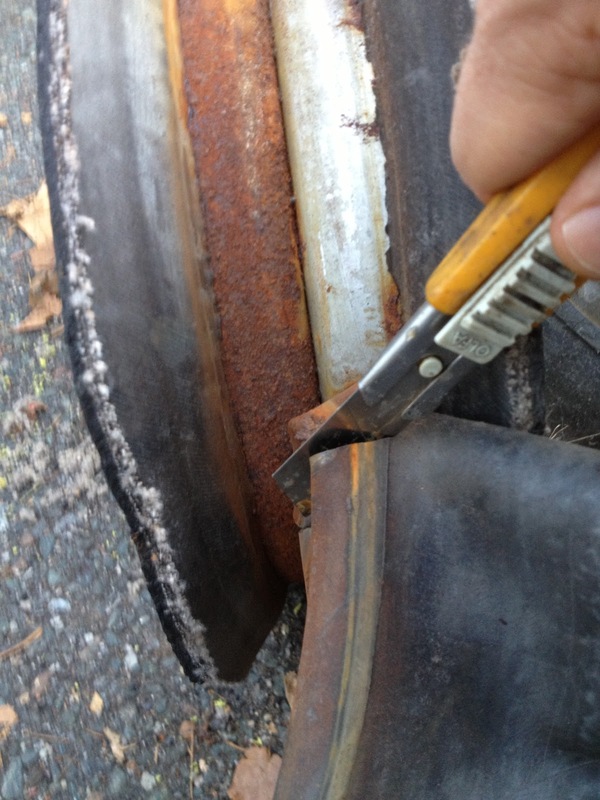 Make a cut into the tread or sidewall. It's actually much easier to cut into the sidewall than the tread. 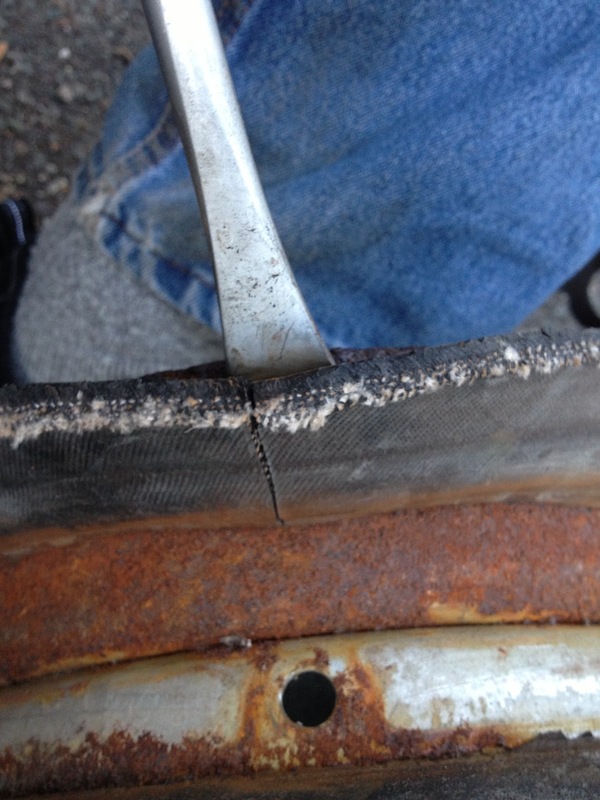 Sidewalls are the weakest part of a tire. 3. Cut around the tire, close to the rim, so the tire comes off the rim. This is very fast; maybe a minute each side. 4. Remove the tube and valve by cutting the excess tube and pulling it out from the inside. 5. Now you're left with a wheel with 2 pieces of stuck tube. You now have to break the inner bead, which is usually reinforced with metal belting. 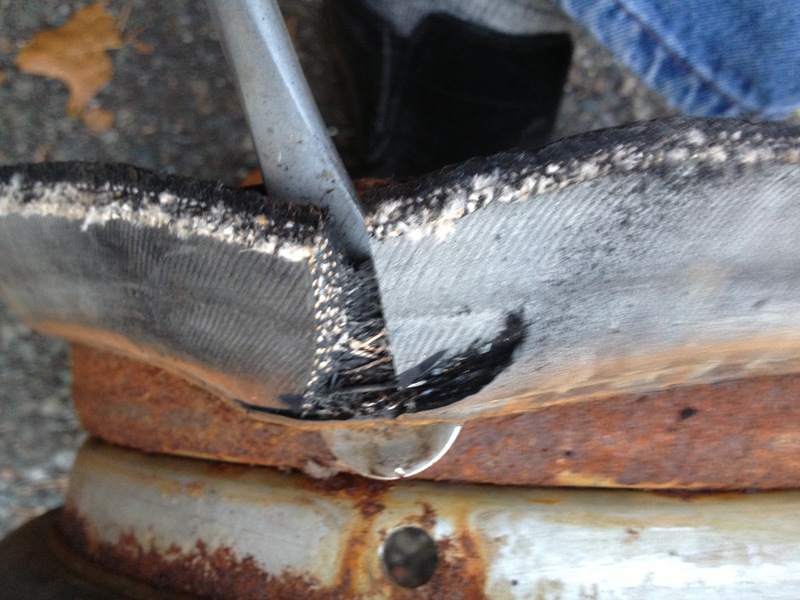 To remove this we're going to use a tire iron, cutoff wheel, and knife. 6. 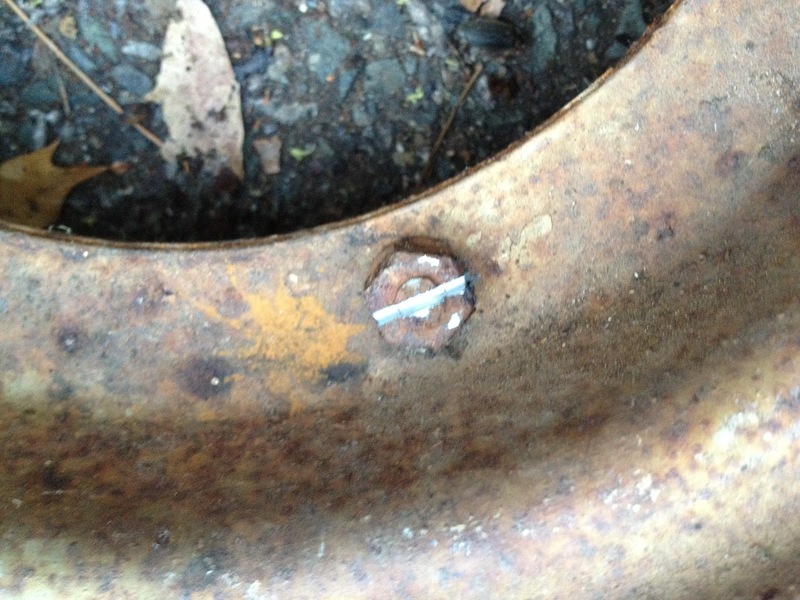 Place the tire iron in between the rim and tire as far as you can, and try to lever the bead in. 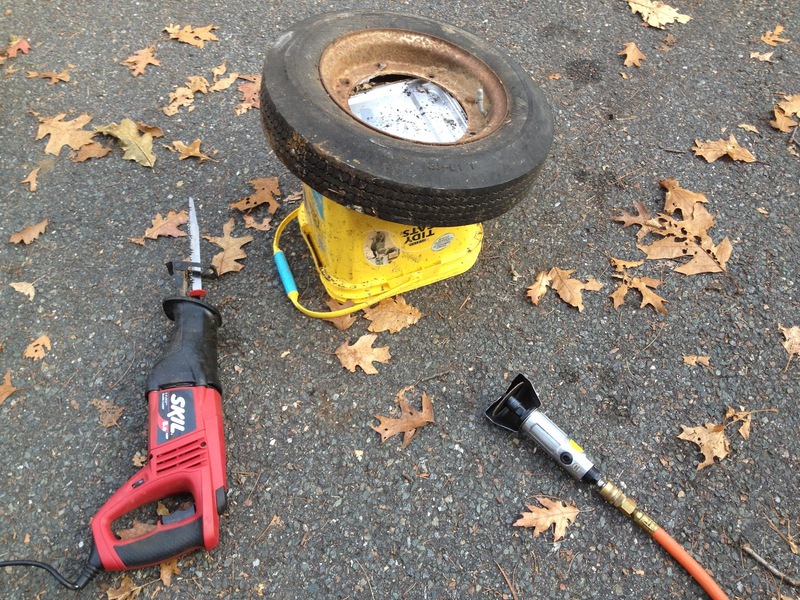 We will use the flat part of the tire iron as an anvil. Now use the knife to cut away as much rubber as you can and expose the metal belt. You can also try this with the cut away tool, but the tire rubber will quickly wear them out.You can burn through a Dremel wheel in about 15 seconds if you try to make the cut in the rubber without pre-scoring and removing some of the material. 7. 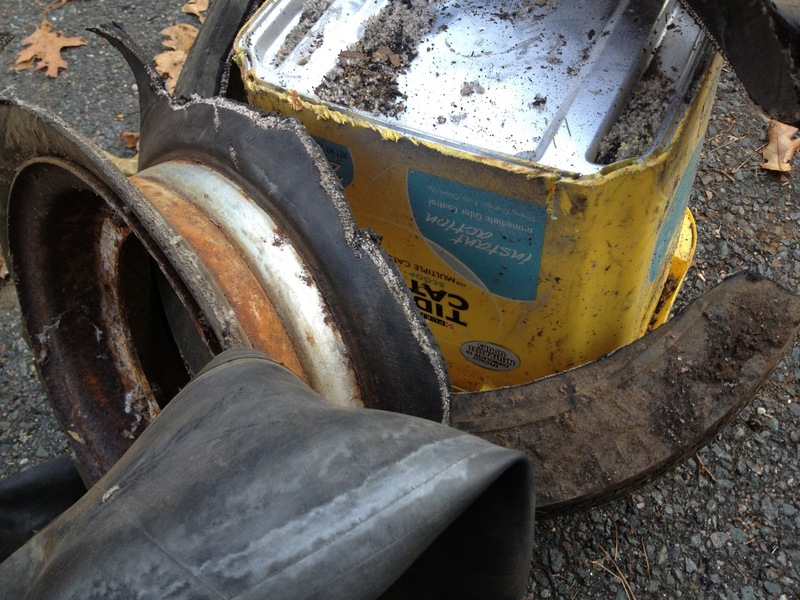 Use the cutoff wheel to cut the remaining rubber and metal belt. 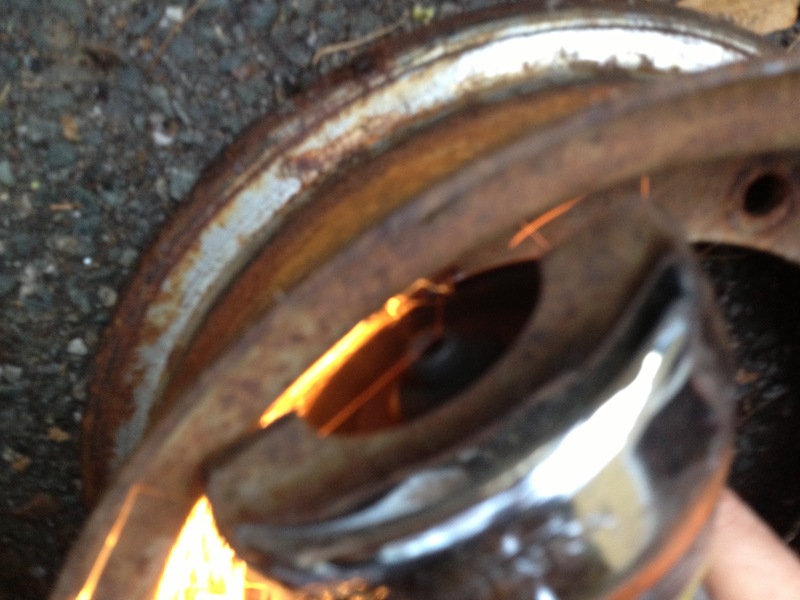 You'll see sparks when you get tot the metal, and you'll get a reassuring "snap" when you break the metal belt. 8. 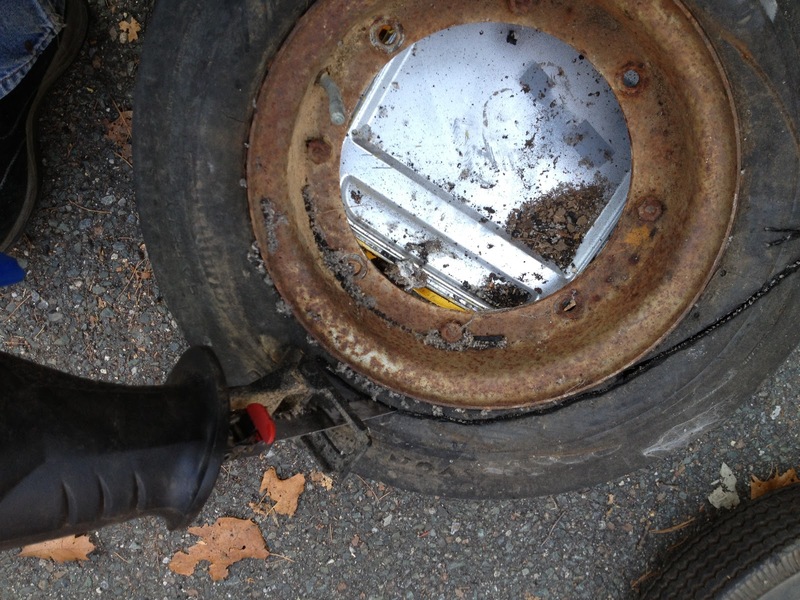 Remove the extra pieces of rubber tire. 9. Now you are left with separating the rims. We're not even going to try to undo the rusted bolts. We're going to cut them off to remove them. 10.Cut slices across the middle of the nut/bolt as shown in the photo. 11. You can now attempt to blast these off with an impact wrench, socket wrench, or breaker bar. Usually the heat generated by cutting will give you enough leverage. If you don't have an impact wrench, you can also spray penetrating oil or PB blaster into the slot you've cut. The oil should penetrate and make it easier to remove after you wait a few hours. That's it. It probably takes 20 minutes per wheel from start to finish, it doesn't cost much, and is oddly satisfying.